When Easton LaChappele was fourteen, he came up with an idea to build a wireless robotic hand controlled by a wireless controlled glove. Unlike the idle drams of the regular teenager, this teenager from a sleepy town in Colorado made sure that his dreams saw light one day. It was one of the most practical ideas he had had so far, but he didn’t know how to turn it into reality. Therefore, he turned to every adolescent’s best friend- the Internet. At the time he knew next to nothing about electronics, but learned through websites, such as Instructables, how to get the robotic hand to open and close its fingers using a combination of fishing line and servo motors.He wanted his model to be made physically. He discovered that manufacturing anything the old-fashioned way was prohibitively expensive, so he started thinking about experimenting with 3D printing. He sent his proposal to several companies and he got quote offers of USD $500 just to print the hand, an amount he did not have to spare. He felt discouraged and ready to quit- what if the project failed? Easton was not willing to give up so soon. He re-evaluated his situation and realized that he had a friend in New York who owned a 3-D printer and who would let Easton use it if he paid the shipping charges. That was the spark Easton needed. The 3D printer enabled Easton to experiment and to start building the robotic arms that he had dreamed of. He wanted to improve the arm’s functionality, so he needed stronger motors and better electronics. By now, he was sixteen, but still had limited financial resources to invest, so he had to compromise between different technologies and motors. For example, he needed an extremely high torque motor with a precise feedback system which was expensive, so he used a DC motor with a gear-box and potentiometer -found in light dimmers -with an ANVOVA Shaft. The end result was a robotic arm, up to the shoulder, which was strong enough to toss balls and could be programmed correctly to mimic the functions of a human hand. 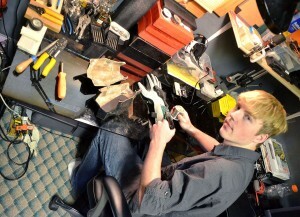 He entered his creation in the 2011 Colorado State Science Fair with his creation. There he had his Eureka moment. He met someone that would change his life forever-a seven-year-old girl using a prosthetic arm. She was wearing a state of the art prosthetic that cost an astounding US$80,000. Upon hearing that figure and realizing that the little girl would have to change the prosthetic arm several times within her lifetime, LaChappelle became determined to design and build an inexpensive alternative, based on the work he had already done, in order to make life easier and more enjoyable from amputees and other prosthetic users. There are other prosthetics available on the markets. However, the main control system for the newer, more advanced models are all neural implants, which requires an open spinal surgery, a highly dangerous and expensive procedure that implants sensors in your spinal cord that pick up one’s neurons, in order to command the prosthetic device. Easton decided to keep all the prosthetic apparel external to the body, in order to eliminate surgical procedures and create something simple that you could put on and take off, whenever needed. So, he created a wireless, Bluetooth brainwave headset, capable of reading of reading users’ brainwaves to control the prosthetics.He used the 3D printer to create each individual parts. Because 3D printing is mostly done in layers, disturbing the appearance, he heated acetone to 110 Celsius, collected the vapors and condensed it on the objects printed, giving them a more glossy finish. Excluding the cost of the 3D printer itself (in this case, a sub-$1,000 Printrbot), the total cost was about $400. That project earned him an invitation to the third annual White House Science Fair, where he presented the arm to the US president Barack Obama, who shook the prosthetic arm and suggested LaChappelle show it to the Defense Advanced Research Project Agency, funding the development of advanced prosthetics. Easton is currently working with NASA on their Robonaut team. He is also working on a side project- an exoskeleton pair of legs which could help paralyzed people to walk. His project was motivated by a boy at his school, who was paralyzed from the waist down in an accident and who was told he would never walk again. Easton wants his classmate to be able to walk for graduation. Sorry, there are no posts. Is Aelita Andre, 8, the Next Picasso? Copyright Taking On The Giant. All rights reserved.